This year, Dahlgren Heritage Museum will be joining the Community Foundation in The Community Give on May 3rd. The Community Give is an exciting 24-hour online event that brings together nonprofits and generous people from around our region. The Dahlgren Heritage Museum was established to provide long-term preservation efforts and educational activities associated with sharing the stories and interpreting the U.S. Navy’s physical, technical, intellectual and social contributions to King George County, the Commonwealth of Virginia, and the nation. The museum supports tourism in a way that respects the history and fuels the economic development of the Northern Neck region. The mission of the museum is to tell the story, not only of the Navy base at Dahlgren, but also of the communities that surround it. The Community Foundation is offering a total of $100,000 in bonus prizes, some of the winning organizations drawn at random from the participating non-profits. Each individual gift the Dahlgren Heritage Museum raises has the potential to bring in more money. Mark your calendars for May 3, 2016—fundraising kicks off at 12:00 midnight and will continue for 24 hours. 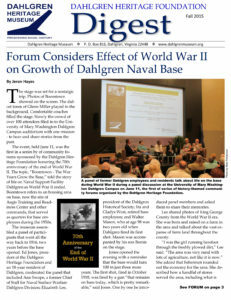 Thank you for supporting the Dahlgren Heritage Museum at https://thecommunitygive.org/.